After leaving our good friends in Aransas Pass today, we kept an eye on the sky to make sure that the rains (though VERY welcome) didn’t dampen the rest of our weekend with the girls and their boyfriends! It’s been an amazingly fun weekend with the girls, with friends and enjoying what mother nature has to offer…be it wind, rain or sun…the weather isn’t as important as the friendships! We understand through well placed sources that the fishing TODAY was much better than the fishing YESTERDAY. At least one source has confirmed that the Redfish in the Bay were biting today — unlike yesterday. We did make a stop in San Antonio and hit the Alamo, the Riverwalk and the Mercado – the best part (other than us all just being together) was the people watching. Amazing how many people were out and about on a beautiful Sunday afternoon after a Saturday full of rain and flooding. It was special to sit and have a snack on the Riverwalk and just spend time with the girls, Bruce Wayne and Clark Kent. What a treat to laugh the afternoon away before heading home to San Marcos and eventually a late dinner and more laughing around the dinner table – these are precious times. 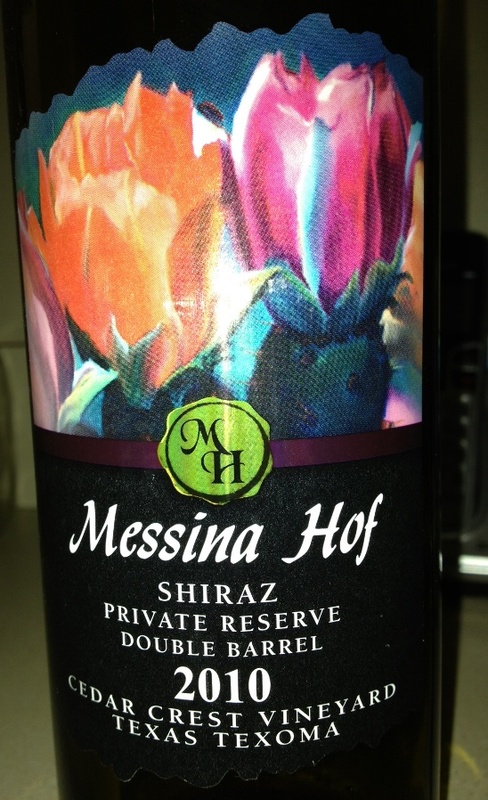 T0night’s wine is a 2010 Shiraz from Messina Hof and features a great nose, full-body flavor and extras smooth flavors. You can’t go wrong with this fabulous flavor display of rich, dark blackberry and spice with lingering vanilla tones. Grown in the Red River Valley. Double Barrel Aged in European and American oak, this Shiraz demonstrates the grandeur of Texas and is perfectly suited for our Texas climate. It’s hearty and robust, yet well-balanced. This Shiraz is wonderful with beef, lamb, pork and even grilled salmon. It is a Double Gold medal winner at the Tasters Guild International Consumer Wine Judging, winner of the Grand Star of Texas at the Lone Star International and a gold medal winner at the Indy International Wine Competition. According to the wine maker, “Planted in 1988 in Denison, Texas. The elevation is at 619 feet , and this vineyard has sandy-loam soil that is four miles from the Red River. A very unique wine featuring smooth and silky flavors of rich berries. Gold medal winner. Perfectly complements beef, lamb, and fowl.” Needless to say, this wine is a winner and is meant to be enjoyed! The wine exhibits a terrific nose of fruit and spice; we couldn’t believe how smooth this wine SMELLED! That’s right—smooth! The taste was equally as impressive, but restrained because, Texas wines just seem to miss out on what the fruit can actually taste like! The finish and body of this wine are both top notch. We can’t imagine a better looking, better tasting bottle of wine from our fair state! The wine went with kung pao chicken tonight and was a terrific complement to sitting on the deck and enjoying the fruits of mother nature’s rainfalls. . . It’s a wine meant to be shared with family, friends or all of the above – which we did in abundance over the past several nights!!! Until tomorrow, please remember to enjoy your favorite wine responsibly and recycle whenever possible! Categories: Uncategorized | Tags: Aransas Pass, Fishing, friends., messina hof shiraz, redfish, san antonio, Texas, the alamo | Permalink.